“Thank you for standing with me – against an administration that ran on banning Muslims from this country – to fight for the America we all deserve,” she added. Omar also urged attendees to “raise hell” and “make people uncomfortable” to combat what she described as Muslim-Americans being treated as second class citizens following the terror attacks. Democrats immediately seized on the tweet, accusing the president of inciting violence against the freshman congresswoman. Omar has been at a lightning rod for controversy since coming to Washington, D.C. The 37-year-old has faced bipartisan blowback for repeated antisemitic remarks and trafficking of anti-Jewish tropes. 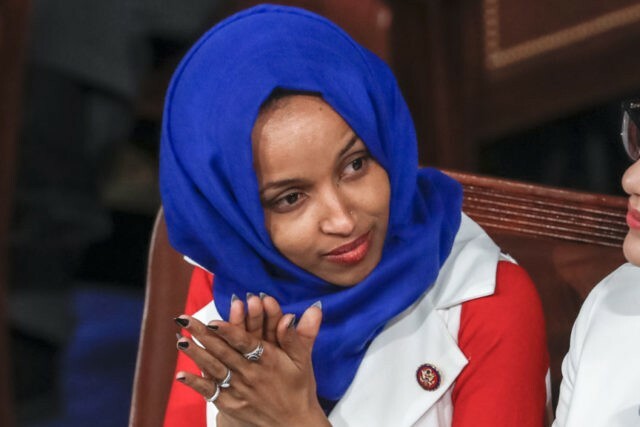 In February, Omar, a member of the House Foreign Affairs Committee, suggested Republican lawmakers are bribed by the pro-Israel advocacy group American Israel Public Affairs Committee (AIPAC) in exchange for supporting the Jewish state. The freshman Congresswoman has also described pro-Israel Americans as those who hold an “allegiance to a foreign country.” She previously apologized for accusing Israel of “evil doings” and “hypnotiz[ing] the world” in a 2012 tweet.